Two articles from today’s New York Times further highlight Italy’s aggressive repatriation policies of late. 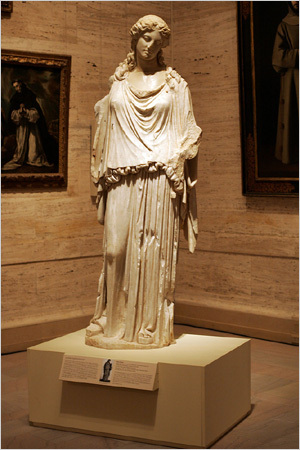 First, a new sculpture, the statute of Eirene, pictured here, is on extended temporary display until 2009 in the Museum of Fine Arts in Boston. Italy agreed to loan the sculpture after the Museum agreed to return antiquities to Italy. The Museum of Fine Arts held a news conference yesterday with Italian Culture Minister Francesco Rutelli to announce the display. The Met will also receive a temporary exhibition of a 4th century B.C. drinking cup, called a kylix. However it has chosen to downplay the agreement. The granting of these two temporary exhibitions by Italy, further underscores its dispute with the Getty over antiquities. The Museum of Fine Arts and the Met have chosen to cooperate with Italy, and have been granted these works. It gives added emphasis to Italy’s threatened cultural embargo against the Getty, after negotiations broke off between the two parties. Second, a private collector has been asked by Italy to return 20 artifacts it claims were illicitly excavated. The collector, Shelby White and her late husband, Leon Levy, acquired a significant collection of antiquities over the last 30 years. Maurizio Fiorilli, a lawyer with Italy’s Culture Ministry, has asked Ms. White to return the objects. The Italians have acknowledged that they do not have much legal pressure to force the restitution of these objects. However exerting public pressure may be their best chance at repatriating these objects. Highlighting Italy’s claims is a study conducted by two British archaeologists, Christopher Chippindale and David Gill. It suggested that 84% of objects owned by Ms. White and her husband which were exhibited at the Met in a special 1990 exhibition were illicitly excavated. Whether this Italian campaign will prove successful and will have an impact on the demand for illicit antiquities remains to be seen. It is an interesting move by Italy to attempt to convince private collectors that purchasing these objects without a solid provenance may indeed be unethical, and may be damaging the very tradition and heritage which they wish to preserve and own. Some commentator have argued for stiffer criminal penalties for collectors of these objects. That seems like a difficult thing to enact though, as these individuals are generally the pillars of their community. After all, Ms. White donated $200 million to NYU for a new antiquities department. A more effective approach may be a campaign to associate collecting of unprovenanced antiquities with the destruction of a nation’s heritage and archaeological record. Previous Previous post: UK Museums falling behind?